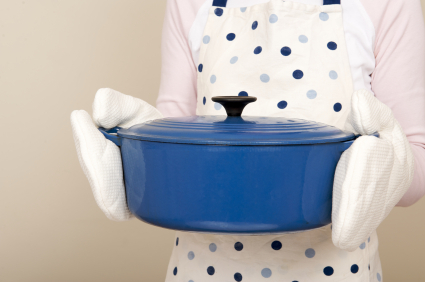 There is much more to consider when buying pots and pans beside how well they heat food, how easy they are to clean, or how pretty they look on your range. We also have to consider the safety of these pots and pans as they are essentially the surfaces upon which our food will sit. No one wants to cut veggies on a dirty cutting board and no one would want to cook if they thought that nasty chemicals were leaching into their food as it cooks. But yet many conventional pots and pans do just that… they leach and they potentially contaminate the food they cook and the air in our home. There are also new materials coming out all the time. I own a couple “green” pans that claim to be safe and non-stick alternatives to Teflon and they are okay I guess but perhaps not as good as some of the traditional favorites. I use my little GreenPan skillet for eggs usually once a week and I have a new ceramic skillet from Xtrema that I will be breaking in over the next few weeks. What do you prefer to use?